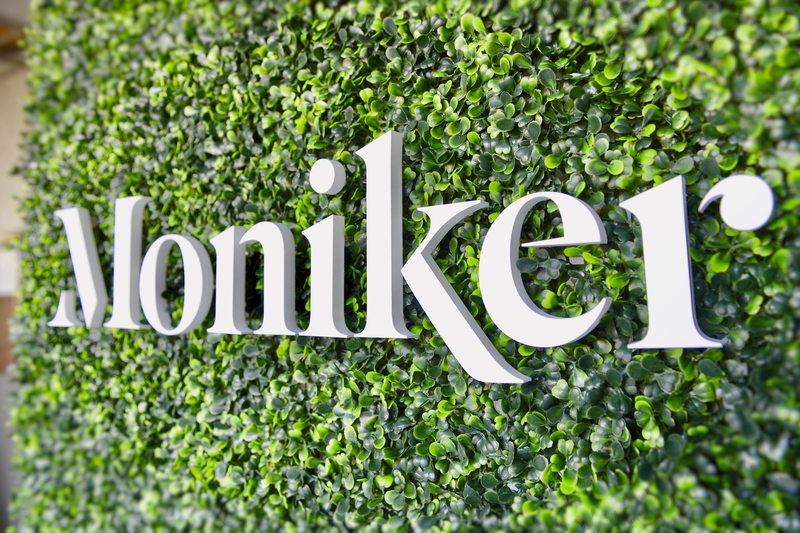 For this example we made a custom company logo for Moniker and mounted it to an artificial ivy panel which they supplied. The ivy hedge was pre-mounted to a flat board and surrounded by a custom white wooden frame. The ivy wall wasn't thick so it was easy to reach the backdrop when mounting. We found that corporate signs, logos and letters make a great feature wall statement and as office decor when combined with an artificial Ivy hedge wall or panel. I want to thank you and your team so much for your incredible work on our sign. It looks AMAZING (exactly as we’d envisioned, really), and we got so many compliments on it during our party last night. I also want to thank you for going above and beyond both in getting the sign ready for us so quickly, as well as all your help around the office yesterday. We were so impressed, and will certainly refer you and your team if we know of anyone looking to have a sign made up. 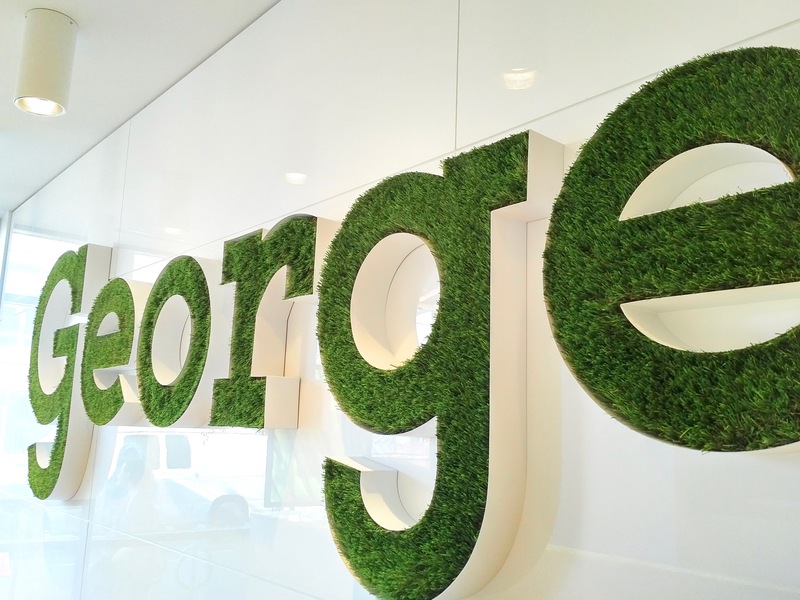 With the green movement in full force, we’ve seen an increase in the use of artificial plant and hedge walls used to showcase cutout names of company brands in office reception areas, building lobbies and at special events and trade shows. More brands are using portable hedge wall backdrops to add life and greenery to their exhibit booths. These hedge walls make excellent backdrops for cut-out company logos and sign letters. Another great way to bring a green eco-friendly feeling to your company sign is by using channel letters encased with turf or moss. If you are unable to pull off a full moss or hedge art wall, we can just flip the idea to make the letters themselves green. Works with most fonts and designs. These letters come in different types of moss, grass and ivy and will add texture, color and depth to any office space. People are prepared to support and pay a higher price for a brand that has a sustainable image (Wikipedia). Green branding helps boost corporate image and adds a unique selling point to your product. “Green” signs are great because they show that your company knows that consumers are increasingly pushing brands to become more conscious of sustainable business practices, the environmental, and its conservation. Complementing your office space with a sign that shows your business is environmentally friendly is the best final step in celebrating a business philosophy and marketing strategy that minimizes waste, enforces the use of renewable resources and truthfully gives back to the environment. A green corporate office sign is like a cherry on top— an amazing way to communicate your business’ hard work in becoming more environmentally conscious for the benefit of your employees, customers and business partners who visit your office. Thinking of Getting a Custom Green wall Sign or Logo?